The "Shadow's Dungeon" SoundPack gives you the complete audio solution when playing the fantastically ridiculous and fun Zombie Orpheus Adventure Module based on the hit web series "The Gamers: Hands of Fate". All the preparation is done for you, and every sound you'll need is right at your fingertips. Including the actual soundtrack from the film and trigger-able lines from the beloved characters of this show "The Shadow's Dungeon" takes players through the adventures featured in the film. Save the Princess! Defeat the ﬂesh golem! And uncover a secret about our world as you learn exactly who the Shadow is targeting with his devious plan.... all in stunning surround sound! 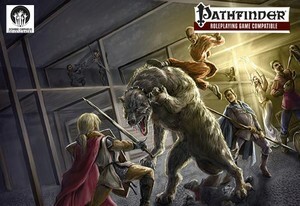 Buy the module on DriveThruRPG here!